Last week I was teaching my students allusions. I introduce a new one every day so that when my students come across with literary, biblical, historical, and cultural references in the material read, they will understand how allusions can actually enhance writing by giving the audience a comparison they understand. The particular allusion I was teaching was “sacred cow.” In addition to giving them the origin of the allusion and defining it, I also give my kids several examples to help them see how it can be used in context. The particular example I was giving at the time was something like this: Chocolate is my sacred cow. 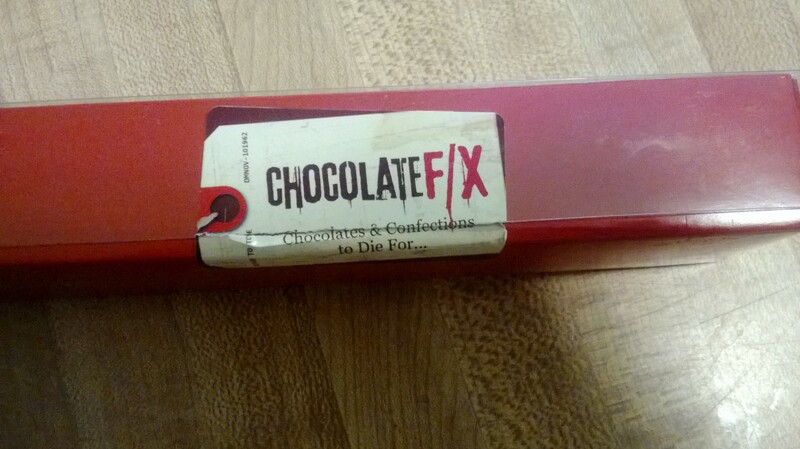 After years of living with me, my husband has finally learned that my super fancy chocolates (and really any chocolate) is off limits unless he buys it himself. 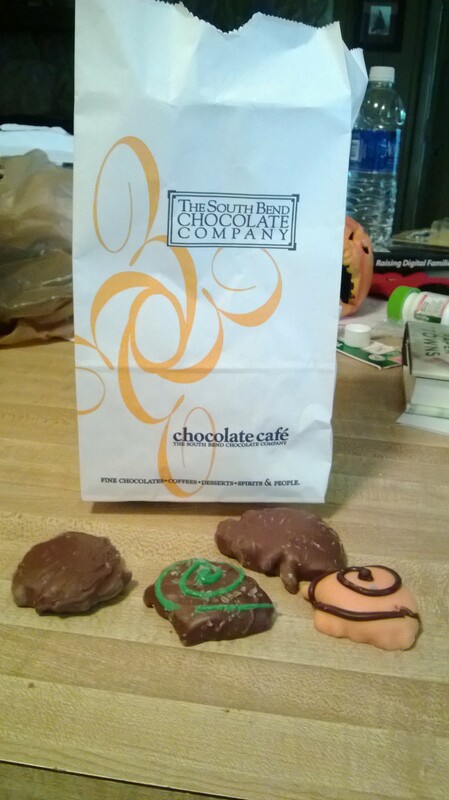 Finding out that I have what some might call an unhealthy obsession with chocolate, one of my little darlings piped up and asked if I’d ever had any treats from his favorite chocolate shop: The South Bend Chocolate Company. Years ago I’d found a little chocolate café in a strip mall with that name and stopped in for some sort of cakey dessert and some pretty decent white chocolate hot chocolate, but I hadn’t had any of their other offerings. As luck would have it, our mall recently opened a little kiosk type outlet full of tasty tidbits to try, so I promised my kids a few chocolate covered pretzels so that I could indulge in something a bit more sinful. Although they offer quite a few different varieties of turtles–correction, most of them are referred to as caramel patties (which doesn’t sound nearly as appealing)– I decided to keep it simple and went for the four with what I hoped would be the biggest yum factor. Because I am obsessed with any combination of chocolate and sea salt, I had to have one of those in my bag. Although it is not yet fall, since that is my absolute favorite time of year, I had to get in the mood for it with a pumpkin turtle as well. I knew I had to try the classic pecan variety and just because I’ve been snacking on delicious salted cashews this past week, I figured I’d get a cashew one to round out my collection. I probably should have snagged a white or dark chocolate variety, but I was going for pure pleasure on this trip and nothing makes my taste buds happier than good milk chocolate. 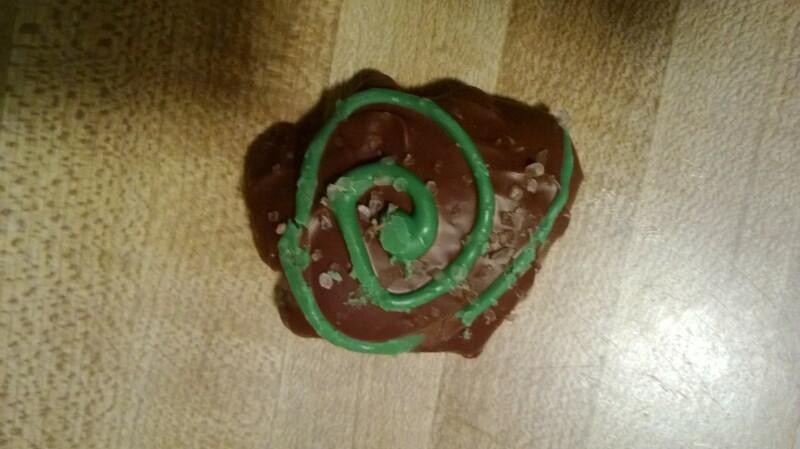 My first tempting treat was the sea salt turtle. Yeah, I know, I’m usually a “save the best for last” kinda girl, but I fortified myself by getting two of these. I figured if I absolutely loved them, I’d save myself another trip to the mall. And, if I didn’t, I could always surprise my husband with a chocolatey treat in his lunch the next day (yes, he often gets the rejects from my chocolate exploits–he doesn’t care, he has no real palate for it–it all tastes the same to him!). The salt grains were a bit larger than I’m used to and the first bite was really overwhelming salty, but not exactly in a bad way. It was a fairly typical turtle. The caramel was sweet and slightly stringy, which I love. The salt was the primary taste, but I liked the way it sort of got stuck in my teeth with the caramel. It was a really nice little after taste even after the treat was gone. In case you are wondering, my husband did NOT get the second one. While I won’t say it was the best turtle I’d ever tasted, it was definitely worth a second tasting. And, I actually liked it better the second time around. Since I was off to a pretty good start, I went for the cashew turtle next. It was a rather big let down. Now, don’t misunderstand, it was perfectly tasty. However, I was looking for something to scream cashewy goodness at me and this just didn’t. I expected the salty sweetness of cashews, but the only sweet was in the chocolate and the caramel and there was no hint of salt at all. Considering how salty the sea salt one was, I was a bit surprised. I was also rather non-plussed by the traditional pecan turtle. Again, it was tasty and I’d certainly eat more of them if they were put in front of me, but nothing to celebrate. It was a bit gooier than its cashew counterpart, which I enjoyed more. The pecans also had the tiniest (and I do mean super tiny) hint of cinnamon, which I thought was cool. 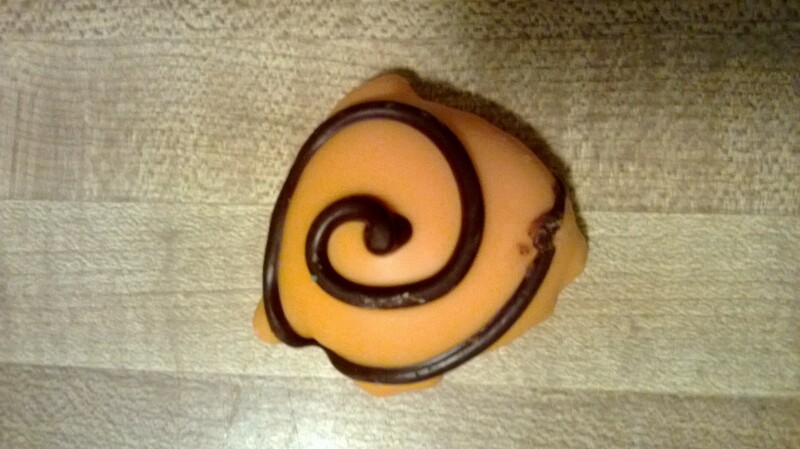 Although after trying the pumpkin turtle, I’m not sure if it was supposed to be there. Speaking of the pumpkin turtle, can I just say: WOW! This one is hands down the winner of the bunch. I actually bought two of these as well, not because I was convinced I would fall in love with it, but because my husband is a HUGE fan of Godiva’s pumpkin truffles and I thought he’d really like it (see, I’m not 100% heartless when it comes to chocolate. I almost always buy him a treat when I stumble upon a new chocolate creation). He actually had his first and his only comment was, “I like that.” That, dear readers, is why I don’t let him have the good stuff. He doesn’t get the pure chocolate joy that I do. He likes it, sure, but he’d be just as happy with a Reese’s cup. Actually, he’d prefer a bag of Skittles over just about any other candy in the world. I swear, I just don’t get him at times. But I digress. Back to this pumpkiny bad boy! There were lovely spicy hints of cinnamon in each and every bite. The nuttiness actually added an almost crust-like taste to the treat, making this a sort of reimagined pumpkin pie bite. The caramel flavor is very subtle and really just adds to the texture of the candy. Come to think of it, it wasn’t just cinnamon that made it so lovely. I could taste hints of nutmeg as well. It reminded me of the wonderful scent that fills the house on Thanksgiving right as the pies come out of the oven. It was a small slice of autumnal heaven and I was sorry I didn’t foist the extra sea salt one off on my husband so I could have had two of these babies. Price: 5/10 (except for that pumpkin one, I would pay WAY more for that one). I make no apologies for the fact that I am a geek. Always have been, always will be. I like comic books and superheroes and comic books about superheroes. I like Star Trek and Star Wars. I love Buffy, Angel and Firefly. I go simply ga ga over Dr. Who. Back in the day I was even known to play some D&D (that’s Dungeons and Dragons for all you non-residents of Geek Town U.S.A.). So, it’s really no surprise that I like Cons. Until this year my conning has been fairly limited in scope. Ok, it’s been extremely limited…to one Con. However, I’ve gone to Wizard’s World Comic Con in Chicago for five or six years now and I’ve loved it. This year my friends and I were all set for another great round of conning when my best friend had to go and get herself a professorship in Georgia. Although we still really wanted to go, the university expected her to show up for pre-teaching meetings the Friday we’d normally be heading to Chicago listening to Florence and the Machines and having a grand ol’ time chit chatting. Since she wasn’t willing to skip her first day on the job (her priorities are so messed up), a dark cloud fell over our plans. That was until another friend of ours (who we meet up with every year at Wizard’s) told us about Fandom/Fright Fest in Louisville. In the blink of an eye, we were making reservations at the Galt House Hotel. We should have known there was gonna be trouble the moment we tried to find parking. The Galt House is pretty darn huge. So huge it actually takes up both sides of the street (with a fun little bridge on the third floor). We weren’t sure which side to park on and when we tried to ask the attendants, they didn’t know what to tell us either. My BFF finally went in and asked and we were directed to the right parking garage. Our room was nice and the place was swamped with fellow conners. In Chicago we never stayed at the official hotel of the con, but at the lovely Aloft hotel, which was really modern and fun. We’d grown really comfy hanging out at “our bar”–the only one in the joint. The drinks were good and the seating was plentiful, at least for the clientele. That was not the case at The Galt House. The place was packed! The main bar which spans the bridge on the third floor was the place to be. I think at one time every single person staying in the hotel was there. Friday night when we rolled in there was a movie playing on a huge screen on end of the room and a side bar set up selling beer and popcorn. We’d already had a few drinks at a really tasty bistro we found while walking around downtown (that is one HUGE plus Fandom Fest had over Wizard’s–location–there were so many awesome places to eat all within about 10 minutes walk of our hotel, whereas the only places to get food at Wizard’s are in other hotels or by ordering carry out which takes forever), so we didn’t quite mind all the people and the waiting. It was fun to watch. That’s one great thing about cons, there is so much people watching to do. There was some sort of drunken pirate show going on and a very nice gentleman in full steam punk regalia tried to get us in, but unfortunately since we didn’t have tickets for Friday night, the event was closed to us. We did, however, have a truly fantastic time talking to him before the show and then again after the show when we saw him in the lounge area. That’s another great thing about cons, you meet so many fun and interesting people. Suddenly all 10,000 or so people attending the con become your new friends. Everyone you meet in line talks to you and since they have similar interests (in a lot of cases), it’s easy to talk back. Now, don’t get me wrong, some of them are total douches, but you can usually weed them out pretty quickly and start up a conversation with someone else more interesting. And, I have to say, if you are a girl at a con, even one who maybe has never felt really been very popular or has been self-conscious about your looks in anyway, cons are the place to be! We always manage to find cute and quirky boys to talk to. While I’m married, one of my friends isn’t and we are always trying to find her a nice geek boy, so we end up talking to a lot of them and their equally geeky friends. This year was no exception. The highlight of my whole trip actually happened Friday night as we were talking to boys trying to make a love connection for our friend. Although we hadn’t even picked up the tickets for the con yet, as we were sitting sipping on cherry vodkas and diet Cokes, John Barrowman walked through the lobby. I won’t lie, I totally fan-girled out. If you don’t know how John Barrowman is, you obviously are not quite my kind of geek. He played Captain Jack Harkness on Dr. Who and then later on the spin-off Torchwood. While I’m not sure if he is my favorite Captain (it’s a toss up between him and Captain Reynolds), he is simply fantastic! As I was slightly hyperventilating over his presence, one of the guys we were talking to asked him if he would take a picture with me. He said he couldn’t stop because he’d already told someone else no and that if he stopped for me he’d have to stop for everyone. I totally understood and told him so. I think I babbled a bit about being a huge fan and thanking him even for talking to me. After he left, I just kept gushing about how I’d seen him. Seriously, I was a mess, which is not me at all. Of course, I was an even bigger mess when two minutes later he snuck up on me from behind, put his arm around me, leaned close and said, “ok, pretend we are talking about something and tell your friend to get her camera out.” As I sat there with a Cheshire cat sized grin, babbling on about how much I love his work, my friend struggled to get her camera out. He laughed and said, “My God woman, take the picture!” and when she did, he was sweet as can be. I couldn’t stop smiling all night. I even did a little happy dance in our hotel room. And I’ll admit it, I told anyone who was interested my story. What was really cool was so many of them had stories too. Since the actors and artists were all staying at the Galt House, they had tons of similar run-ins with fans and were all super nice, willing to stop and talk and take photos. It was kind of awesome. That, however, is where the awesome ended. The con itself was a bit of a nightmare. I’ve never been in a more unorganized situation in my life. No one knew which line people were supposed to go in, including the workers who were supposed to be directing people to lines. Despite arriving well before the con floor opened, we waited in line 30 minutes for tickets we’d already purchased. Then, we waited in line 30 more minutes to buy a photo opportunity with Adam Baldwin (Jayne from Firefly). I waited about 30 minutes for John Barrowman to sign my copy of his book Anything Goes, which wasn’t too bad since the people in line were super friendly and included a little boy who was about four and the spitting image of Matt Smith’s Dr. Who. 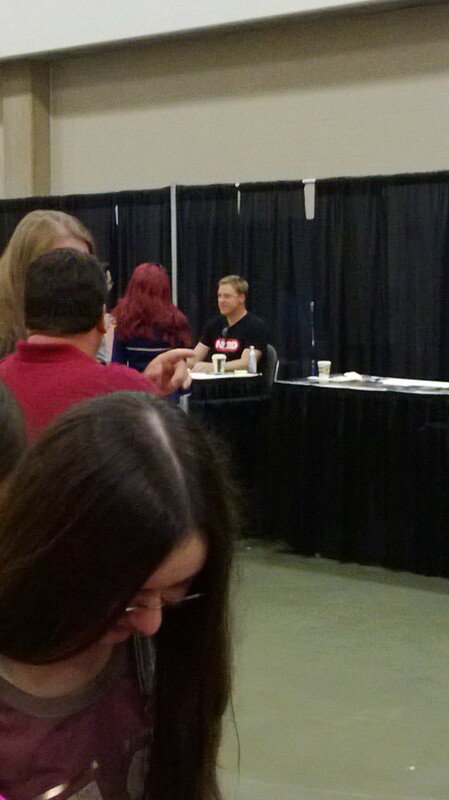 It was also cool because I got to snap this cute (and illegal) picture of Alan Tudyk on my phone. The rest of the con was a let down though. There weren’t that many vendors. Not that I usually buy a lot, but I like to look at the wares. There were hardly any artists at all, which is actually a really cool feature of Wizard’s–all the independent artists who have booths there. In fact, our first year at Wizard’s, we met an artist named Josh Johnson and not only did we buy some of his art, he became our friend. The layout of the place was nuts. There were no real maps to figure out where events were going to be held. The staff, aside from being clueless, actually forgot several actors at different places around the city. They left John Barrowman at the airport. They forgot to pick Alan Tudyk up from the hotel to bring him to his signings (and when he managed to get there, security didn’t seem to understand he was an actor, despite his celebrity badge–fans had to badger them to let him in), Colin Baker was never picked up for his panel, so he tweeted to his fans from his hotel room, John Barrowman’s panel had to be moved because they scheduled it the same time as his photo ops, Stan Lee’s panel ran over, so they cut the Firefly cast’s panel short, the director of Monster Squad wasn’t told he had a panel until a few hours before he had to host it and other panels were advertised but didn’t take place and had no cancellation notices. As if this wasn’t bad enough, the lines were atrocious. We didn’t actually get to see any of the panels we wanted to because there were two lines to get in to each panel, the VIP line (for people who paid $175) and the regular line. Before they let any regular ticket holders in, the VIP’s got first dibs, so panels were filling up 1/2 and 3/4 full of VIP’s only. The photos from Saturday weren’t ready by the time they shut it down at 8pm, so they told everyone to come back the next day to get their photos–the only problem was we didn’t have tickets for the next day. Luckily I managed to find the only helpful employee (who was 6 months pregnant) who let me in and then made our picture a priority. The lines to see some of the celebrities were outrageous. There were a slew of actors from The Walking Dead there and the line for Norman Redus was over two hours for VIP’s and over 5 hours for non-VIP’s. They seemed completely taken off guard by the number of fans who showed up for the con, which I find odd considering most of their sales were pre-orders. Although I loved many aspects of this con, I’m not sure I’d ever go back. The shear lack of order and the hours wasted in lines was just a bit too much for me. A few weekends ago I attended Fandom Fest in Louisville, KY. While I’d been to several comicy type conventions before, this was my first trip to Fandom/Fright Fest. I was actually scheduled to go to Wizard’s World Comic Con in Chicago, but my darling BFF had to go and move halfway across the country and wouldn’t be able to go to Chicago with me because she’d be starting her new job. Since the con is always our big girls’ weekend, we opted for Fandom/Fright fest since it was within a day’s drive, was held two weeks sooner and had the added bonus of being the hometown of a friend of ours. While there were quite a few things about Fandom/Fright Fest which disappointed me (I’ll have another blog about that on Wed dear readers), I was super excited to find a little chocolate booth set up in the vendor’s hall. In all the years I’ve been going to Wizard’s World, there has never been any sort of edible treat to purchase (aside from some damn tasty twisty cones at the snack stand). I’ve always reserved my chocolate buying for Ethel M’s (before they abandoned me) and Vosges on Armitage Street. Fandom/Fright Fest not only boasted John Barrowman (of Torchwood and Dr. Who fame) and three cast members from Firefly (Wash, Jayne and Kaylee), but also Chocolate F/X. This seemed inspired to me. 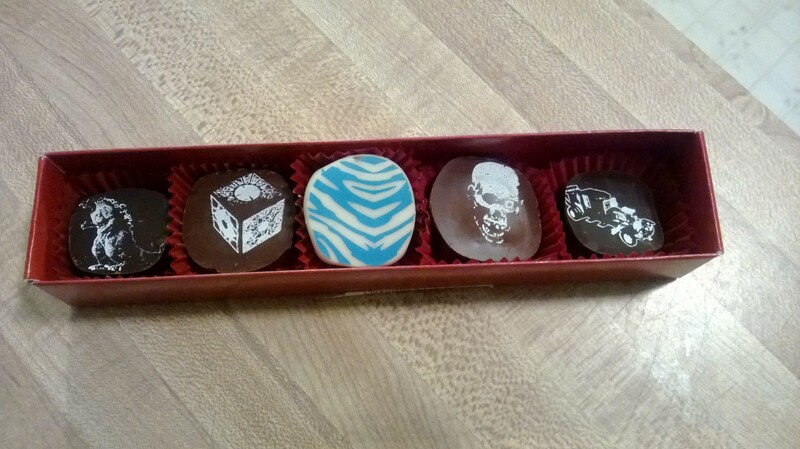 My friends grabbed a package of the toffee to split, but being the sucker for truffles that I am, I had to go with the fancy decorated chocolates. I mean, I love toffee and all, but who can argue with chocolate that has Dracula, Godzilla, Frankenstein and other horror classics on it? Not this girl. Turns out that despite the fact that one type of toffee was clearly labeled as bacon toffee and the other wasn’t, my poor BFF, who has been a vegetarian for like 12 years now, accidently bought toffee that also had bacon in it. Our other friend lucked out as she loves bacon, so she got all of the toffee. Bad marketing. The first one I tried was the dark chocolate Godzilla. I was not at all impressed. The filling was a caramel of sorts, but it was overly sweet in a really artificial way. Now, I know I’m not a huge fan of dark chocolate, but that is usually because I don’t like the bitter taste (and after taste). This one was not at all bitter. In fact, it was sort of cloyingly sweet. The caramel was super chewy and had a vaguely liquorish taste. I don’t mean licorice like the candy, I mean liquor as in alcohol. The only problem was that I couldn’t place the specific spirit it seemed to be trying to replicate. All I know was that I did not like it. No sir, not one bit. 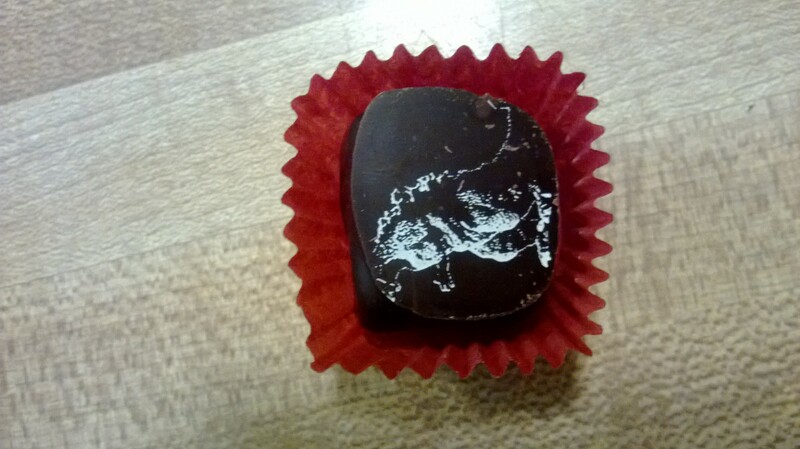 The other dark chocolate offering, which looked a bit like Dracula’s dune buggy was a bit better. It was still sweet and not bitter, but it wasn’t as sweet. 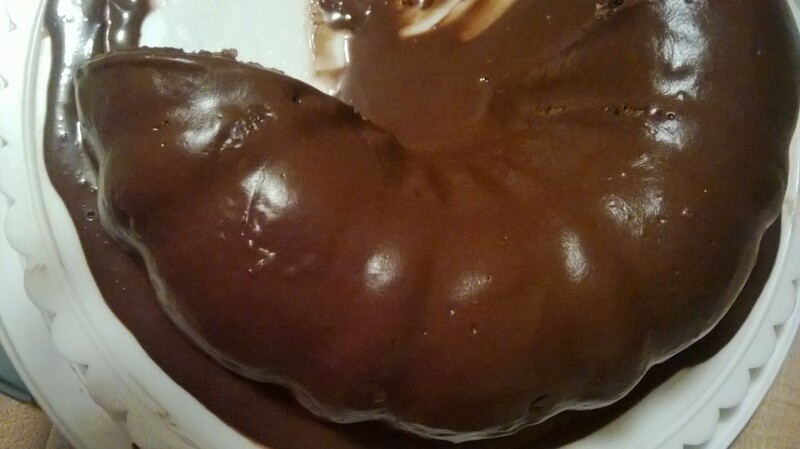 It had a rather non-descript chocolate filling. It was a bit like a brownie, both in texture and in taste. It was a bit chewy, but overall, not too bad. Nothing to write home about, but also nothing like that caramel I didn’t like. Since I’m a save the best for last kinda girl, after I got rid of the dark chocolate, I moved on to the milk, hoping that the overly sweetness of the candy had something to do with the darkness of the chocolate. My hopes were quickly dashed. 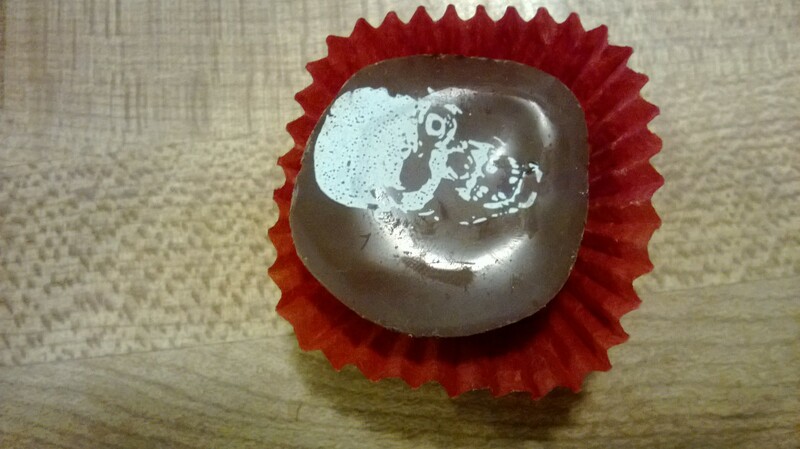 The first milk piece, which had the sort of zombie skull on it also had a chocolate fudge-like filling. It was also better than the caramel, but still too sweet for even my sweet tooth. The second milk piece nearly killed me. When I turned it over, I noticed the salt on top of it and figured it was a sea salt caramel. Well, it was a salted caramel all right…a spicy salt and a pepper caramel. And not the harmless black pepper kind either. One bite set my mouth on fire. I like the combo of sweet and hot, but when my lips are tingling after 8 ounces of water, I like it much, much less. I think the caramel itself would have had a better flavor than it’s dark companion, but it was too hot for me to really figure out. The final piece was the white chocolate piece. It was my favorite, but the flavor was a bit indistinct. There were definitely some sort of coffee hints, which really shocked me as I don’t like coffee one bit. Coffee pieces are usually my least favorite, but this one was a bit more chocolate mocha than straight coffee, which made it better. Not great, but better. Two years ago my step-mom got me a cooking magazine for Christmas. Now, it wasn’t the only thing she got me and since we had to haul all the presents nearly three hours back to our house (to be fair, most of the presents were for the kids), somehow it got misplaced. I honestly didn’t even really think about it. Not because I’m an ungrateful brat (at least not anymore), but because I remembered it as just a magazine and my step-mom was famous for buying those flimsy cooking magazines at the register which promised 50 new ways to use Bisquick or 25 lite menus using Crisco. Over the years, I have looked through hundreds of these magazines. Most of them were about the size of a 5X7 photo with lots of glossy pictures of fancy decorated cupcakes or cookies. I’d get excited about recipes I might want to make, but I’d forget to copy down the recipes and by the time I thought about making the treat, she’d thrown away that particular batch of checkout delights and gotten a whole new batch. However, about a year ago, while I was finally getting the rest of the kid’s Christmas goodies out (we like to bring out a new toy every month or two, so they get excited about them again and we can secretly get rid of older toys without them caring as much), I discovered it again. It was not one of the flimsy books that used to decorate her kitchen cabinets, but rather a much heartier collection of desserts which all boasted starting with a boxed cake or brownie mix. I figured what the heck and flipped through it. What I found tickled me! Tons of recipes that looked fairly simple and super tasty. The first one I tried was actually for my son’s kindergarten pitch-in. His school mascot is an owl and there were adorable little owl cupcakes that used Nutter Butter cookies. I was so excited about the amazing cuteness of my owls that I totally spaced the school’s peanut butter ban. Luckily it was held at a parent house rather than the school and there were no kids with peanut allergies in his class (I actually knew this second fact, but peanuts are still banned at his school). The oohs and ahhs I got over the cupcakes sent me on a bit of a baking spree. So far I’ve made over a dozen of the incredible edibles, ranging from whoopee pies to gooey pumpkin bars to German chocolate bars to what is basically a grown-up version of a Hostess cupcake. All have been phenomenal. 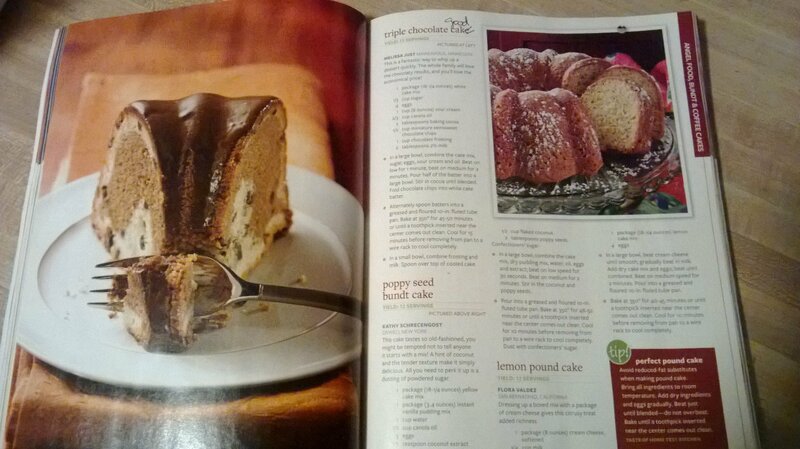 One of the greatest parts of this book is the Bundt cake section. Years ago my MIL bought me a Bundt pan. I’d never made a Bundt cake before, but since I had all these recipes claiming to be amazingly simply, I threw caution to the wind and ventured into new territory. Oh my am I glad I did. Although I have made about half a dozen of the Bundt cakes so far, my most recent test was the triple chocolate Bundt cake. This baby is fantastic! It is moist. It is chocolatey. It has just a slightly hardened edge that gives it an amazing texture. Despite using a white cake mix as a base, every bite of this cake is pure chocolate. There are mini chocolate chips in half of the white cake mix, Penzy’s Dutch process cocoa powder in the other half and a frosting that is basically just bit of canned chocolate frosting and milk. 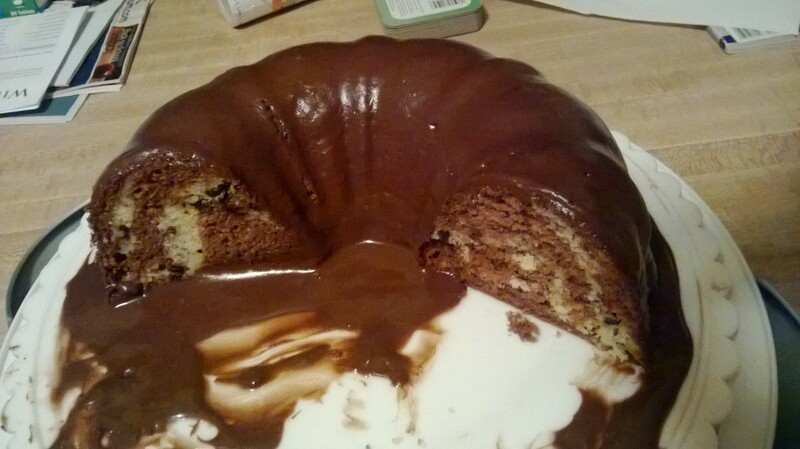 The batter is put into the pan in layers so it gets all swirled together just like the best marble cakes. The only downside to this cake is that the frosting is a bit runny, even when spread on a very cooled cake, so it does tend to pool in the middle and around the edges. Granted, that means more frosting to scoop up with every slice, but it also means a bit of a mess that doesn’t always look pretty when serving. Still, this recipe is so good when I brought it to a party one friend had three pieces and the others all raved about it all night. If you can find a copy of this cookbook, get it. You will thank me. 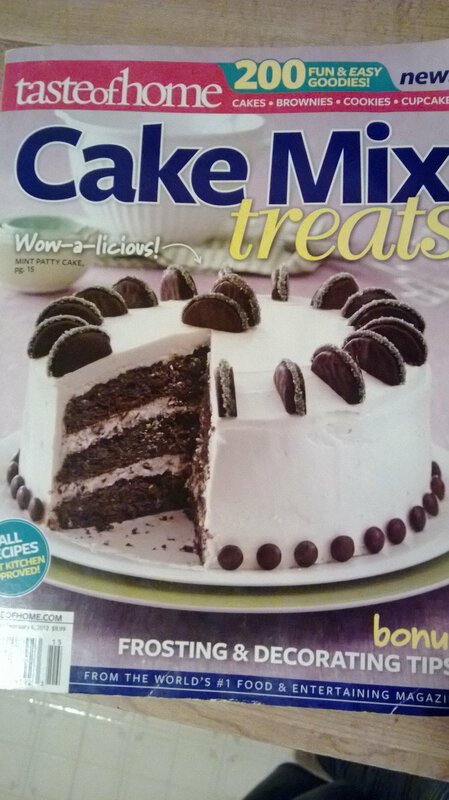 I know, it may seem like cheating to use a boxed cake mix, but really, who has time to make everything from scratch? Certainly not this full time teacher and mother of two. The cakes, cookies and bars don’t taste boxed and you will amaze your friends and family with these tasty treats. Cost: 10/10–really cheap to make!